I went for a get-together dinner session with Peter’s friends and old mates two nights before. 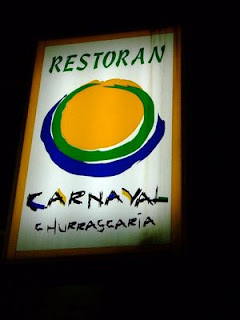 It was a nice carnivorous experience at Carnaval Churrascaria, a Brazilian Restaurant at Damansara Jaya area. 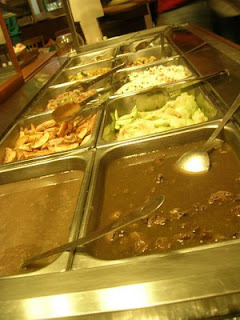 Although the name “Churrascaria” itself suggested bbq feast for carnivores, however the salad bar offers quite a range of different vegetables which includes spinach, coleslaw, stir fried french beans, caulis and potatoes salad, wedges, mashed potatoes, black beans, beef stew, pasta etc. Hence, the restaurant still caters for the need of those who are not too fancy over meaty meal. 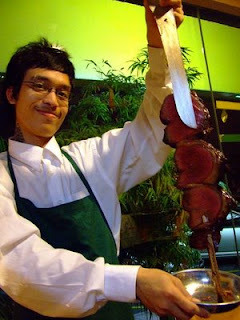 The passador or the waiter will bring out cuts of barbecued meats (some in big loaf) on skewers, and move around, carving the meat at your request. The big knife which he used to carve and slice out the meat are a bit scarry though. 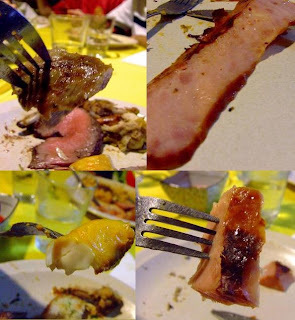 I cant really differentiate the taste of Brazilian barbequed meat and the usual d.i.y. barbecued meat, except that it was grilled to perfection, not much of the burnt charcoal bitter taste, and very aromatic as well. On top of that, the meat went very well with the self made mint, salsa sauce and others like HP and Lea & Perrins Worcestershire sauce. The range of the meat they served wasnt that much of variety actually, there are lamb, garlic beef and medium rare beef slices/ribs, chicken, Chicken Ham, sausages, and fish. Peter’s mates mentioned that they used to have prawns and gizzards as well. To my surprise, the lamb actually tasted better than beef, usually i’m not so much of a lamb person as i’m put off easily by the lamb smell, but they’ve done it nicely, juicy and succulent, maybe its the Brazilian secret recipe. The signature beef (see image below) was something i don’t dare to try, cuz i can see the meat was bloody red, chewy and it leaves traces of blood in the plates. urghhh…. .
Its a good place for the carnivores as you can eat all you want for RM48++. In my opinion, there is still some room for improvement for the ambiance though, it would make a whole lot different if they can play some nice Brazilian song and make the environment more lively rather than just hanging a Brazil flag next to Malaysia’s.